Gallery - RG Stones (Buildings) Ltd.
10 Bay cedar clad classroom with colour matched timber windows and doors. Aluminium glazing and a covered decking area take advantage of views over surrounding countryside. A cedar clad building with powder coated aluminium windows and doors to match the school’s colours. A bold boxy design that turns heads. 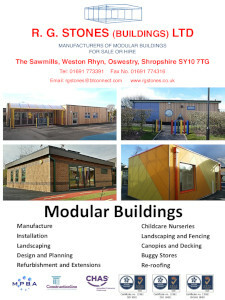 Modular school buildings. Colourful and innovative designs to enhance the learning experience. Pairs of mono-pitched building modules were installed back to back to create a substantial 14-bay building. A 4-bay building for Coventry City Council featuring sealed western red cedar cladding. 6-bay modular nursery building. Bold primary colours give the building an atmosphere that is smart and playful. 12-Bay Modular Nursery and Classrooms along with associated landscaping. Contemporary natural finish creates a strikingly modern and fresh look with raised pararpet walls. Single bay teaching room in red stained cedar with black fascia and skirts.